Merger creates industry’s broadest and most technologically advanced line-up of waterjet products. With the new HyPrecision® Predictive waterjet pumps, seal wear is no longer a mystery. Product info, videos and where to buy the Powermax45® XP plasma cutting system – Hypertherm's industry-leading air plasma system. At Hypertherm, we are shaping the future with cutting and gouging solutions that can make anything possible. Choosing the right technology depends on many factors, from materials to cut quality preferences. Find the right technology for your job (from plasma to waterjet) and continue your research on our website. Please contact us at anytime to speak with one of our cutting experts. How can I maximize my performance? Achieve greater performance and productivity by optimizing the cutting process so you can focus on your business and your customers. We’ll help you quickly find an authorized partner in your area where you can buy, rent or repair a Hypertherm product. 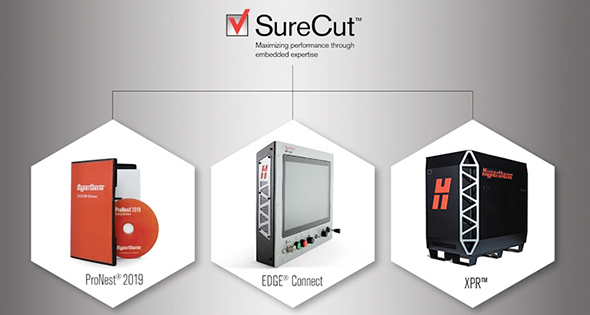 To make sure you get the most from your cutting investment, please take a moment to register your product. Appropriate safety, warranty, and technical support information. Relevant new product and update information. Free access to our online product training content. Join us at Aerodef Manufacturing. Join Hypertherm at FABTECH Mexico at booth #1712.